Been scouring the net for somewhere to drink in South London? Stop! We've got just what you're looking for right here. A selection of the trendiest, coolest and most vibrant cocktail bars in Clapham. From a traditional margarita to something a little bit different, we've got it all covered. SOUK is one of Clapham High Street's most vibrant bars. 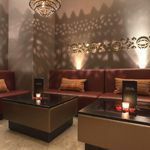 SOUK offer mouth watering cocktails, stylish surroundings and a great atmosphere, with regular Club nights and top DJs. 64th and Social are offering something a little bit special. They are a restaurant with a pretty fancy cocktail bar in Clapham. If you're in the South, it's definitely worth a visit! If you're looking for a quirky cocktail bar in Clapham, this is it. There's a few of the traditional cocktails that you'd expect to see, but there's also a large selection that you've never heard of, but will want to try!! 50 Shades of Earl Gray anyone? Aquum is the place to go for something a little bit fancy. If you're looking for a cocktail bar in Clapham that's going to offer you an expertly made cocktail with premium ingredients, then this is the place to visit. Fancy an Almond Mocha? Or maybe a Japanese Slipper? (Tastes better than it sounds, I promise!) This cocktail bar in Clapham is one you need to visit. Be At One don't mess around, they know their cocktails! What's not to love? Pizza and cocktails 'til late at this popular cocktail bar in Clapham. Dim sum, dancing and a Dragon Fruit Paloma......SOLD! Once you're here, there's no need to go anywhere else for the rest of the night. This awesome cocktail bar in Clapham is perfect if you're out for a couple of drinks, or you want to really let your hair down. Looking for a cocktail bar in Clapham where you can have a nice romantic night out with your significant other? Or perhaps you're looking for somewhere to go and wave your hands in the air like you just don't care? Yep, this place does both. They do pretty epic Mojitos here too, i'll have one of each please! The Jam Tree is the place to get down with some Gin 'n Juice to your favourite tunes. A cocktail bar in Clapham with a difference. A cocktail bar in Clapham that offers live music, pizza and a pretty epic cocktail menu. Something for everyone here! Pledge your allegiance (that's one of their cocktails) to Revolution bar! This ultra cool cocktail bar in Clapham is one that you won't be able to get enough of. This isn't a regular run of the mill bore-fest, only go if you're prepared to order a drink and it possibly be served in a bucket! Not your average bar. Awesome DJ's, enough cocktails to keep you going through an apocalypse, and pretty delicious food. This is a must visit cocktail bar in Clapham. Aloha, and welcome to South London.....hang on, what? Yep, Sugar Cane is a cocktail bar in Clapham that you will want to see. They promise to give you that holiday vibe, but unfortunately not that holiday weather. We are in South London after all! Music and live acts every day, 2-4-1 cocktail offers, and pizza. How do I book? This cool cocktail bar in clapham is one you and your mates will just keep coming back to.